Red City Hall Berlin, also known as the Rathaus, is where the Berlin government and the mayor himself of the capital is located. As a symbol of power in Berlin, City Hall stands out with its red facade of the central square Alexanderplatz in the city center. Interesting for its architecture this building was built of red bricks. Outstanding remains the tallest tower and the central part of the building remains a beautiful fountain Neptunbrunen. In this part of Southeast Alexanderplatz, Red City Hall is the fifth building, which rises in this space. First city mayoralty was built in 13 century. 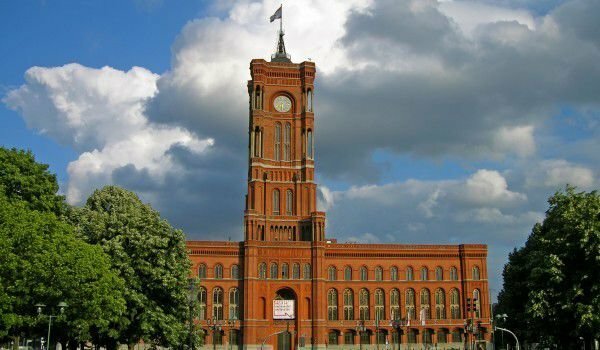 This building dates from the late 19th century, its foundations were laid in 1861, and the Red City Hall in Berlin was fully completed in 1869. The building of City Hall was built in the spirit of the northern Italian Renaissance architectural style, according to the views of architect Hermann Friedrich Waesemann. During construction an entire district of Berlin has had to be completely destroyed to make way for construction materials on City Hall. The building was erected on an area of 99 by 88 meters. The architectural plan requires the red building of the Berlin City Hall have four wings, but the interior has intermediate such as to create three internal courtyards. The building replaced a medieval old town hall building, which over time turns out to be unfunctional. Only two years after building is completed, the German Reich was unified by Kaiser Wilhelm I and Berlin became the most powerful capital of the old German Reich. At the time of William I The City Hall did not cease to hold top level meetings and other important state events. Kaiser himself was a patron of the construction of the Rathaus. 74 m high tower of the Berlin town hall is a replica of one that has a cathedral in the French city Leon. In 1879 to the interior of the first floor was added a lovely tiled composition. It depicts scenes from the history of Berlin in 1871, it is crafted from 36 panels, each of which is 6 meters in length.